Which Essential Oils Will Induce Labor? According to the National Association for Holistic Aromatherapy, essential oils are "highly concentrated aromatic extracts which are distilled from a variety of aromatic plant material including grasses, leaves, flowers, needles and twigs, peel of fruit, wood and roots." Essential oils have a number of properties including tonic, sedative, and stimulant. Some essential oils are emmenogogue, or stimulate blood flow to the pelvis, and can actually trigger uterine contractions. Clary sage, salvia sclarea, is less toxic than the garden sage and is extracted by steam distillation from the flowering tops and leaves of the stout herb. It is a colorless or pale yellowy-green liquid with a sweet, herbaceous scent. According to Julia Lawless, author of "The Illustrated Encyclopedia of Essential Oil," the oil's principal constituents include linalyl acetate, linalol, pinene, myrcene and phellandrene. Lawless says the clean-smelling oil is antidepressent, sedative and uterine, among others. The American Pregnancy Association (APA) lists clary sage and jasmine as essential oils that can help contractions and ease muscular pain. Pain can sometimes slow or halt the progress of contractions. To stimulate labor contractions, clary sage can be mixed with a carrier oil such as jojoba or almond oil and massaged into the abdomen. Jasmine essential oil, jasminum officinale, is extracted by steam distillation of the absolute, which is extracted from the concrete using alcohol. The concrete is produced by solvent extraction from the evergreen shrub's flowers and roots. Jasmine essential oil has a rich, warm, floral scent and over 100 chemical constituents including benzyl acetate, linalol, phenylacetic acid, benzyl alcohol, farnesol, methyl jasmonate and numerous others. These constituents give jasmine its antidepressant, anti-inflammatory, aphrodisiac and uterine tonic properties. Lawless states that jasmine has long been used to "warm the womb and facilitate birth." Jasmine can be massaged into the skin by adding a few drops to a carrier oil or diffused into the air. Lavender essential oil, lavandula angustifolia, is the star performer among aromatherapy's luminaries. 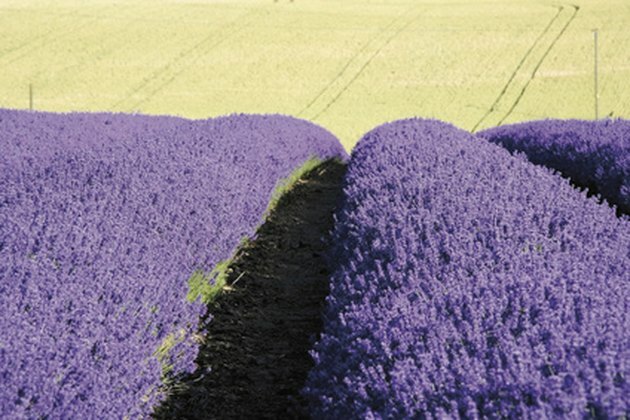 Best known for its ability to calm and sedate, lavender essential oil is extracted by steam distillation of the flowering tops of the tall, woody shrub, although the entire plant is highly aromatic. Lavender also contains over 100 chemical constituents including linalyl acetate, linalol, lavandulol, terpineol, cineol, limonene, and many others. These constituents vary depending on the altitude in which they are grown. Lawless states that lavender is an emmenagogue, which stimulates contractions of the uterus and encourages menstruation. According to the APA, lavender can help create a tranquil, relaxing atmosphere which can reduce pain and facilitate contractions. Lavender can be applied directly to the skin, mixed with a carrier oil, diffused into the air, or mixed with water and sprayed onto the skin. A light mist to the face is especially refreshing during labor. Are There Herbs That Slow Down Your Heartbeat?